Low prices. OrangeSmile.com offers car hire service in Ireland on the lowest-rate-guarantee basis, since we work with car suppliers directly. For your search criteria in Ireland, we always select and show the best rental offers. The car reservation process consists of 3 simple steps: (1) search for available cars for your dates in Ireland; (2) select your car type; and (3) fill in the booking forms. Once the reservation is completed, you will receive a confirmation voucher to your email address. During the booking process, please check your rental conditions. To pick up your car at the rental point in Ireland, you need to provide our confirmation voucher, your driving license and a valid credit card. The final payment is normally carried out at the pick-up point. Our car hire points in Ireland accept VISA, MasterCard, etc - please check your rental conditions. At the pick-up point, please read the handling manual and check the car for present defects. OrangeSmile.com wishes you a pleasant journey to Ireland! The car hire reservation system OrangeSmile.com allows renting a vehicle in Ireland within 10 minutes. Our largest database of car suppliers enables us to provide you a rental car in Ireland at the cheapest rate ever possible. At rental locations in Ireland we offer the following car sizes: mini, compact, economy, standard, premium and luxury. The following car types are available in Ireland: Sedan, Hatchback, Jeep, Cabriolet, Coupe, Minivan and Minibus. Because of wonderful nature, Ireland is often called “the Green land”. Rocky coastline, calm ocean with deep blue water, green valleys and hills – this is a short description of one of the most beautiful countries in Europe. 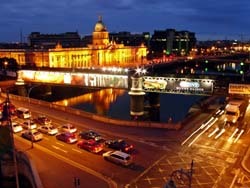 The best way to start your exploration of the country is to visit its capital, Dublin. The main education centre of the country, Trinity College, is worth closest attention. The age of the college is more than a thousand years. It is located in a beautiful building made in Victorian style. There is a library near the college, which keeps the symbol of Ireland – “the book of Celts”. This is an ancient manuscript of Christian culture and a priceless artefact. The cities of Galway and Cork are popular tourist destinations. The latter is also the location of an annual jazz festival, so this city is well-known to all music connoisseurs. Galway is famous because of a completely different thing. The city is renowned because of the biggest National Aquarium in the country. The aquarium is home to several thousand species of marine animals. Medieval castles remain the most precious architectural landmarks of Ireland. It is possible to see them in every part of the country. Blarney Castle is located on south of Ireland and is famous far beyond the borders of the country. There is an interesting legend connected with the castle. According to it, Saint Patrick (the first Christian preacher) got a magic stone as a gift. The stone is still kept in the castle, and every visitor must kiss the stone, this way expressing respect for culture and traditions of the country. Bunratty is the youngest, but no less popular castle in Ireland. It was built just a couple of centuries ago, but was made in elegant style of early medieval. One of the castle’s halls is used for theatre performances. Various banquets and entertaining performances are also not rare in the castle. Castlerock is one more interesting historic place. Long time ago there was a castle on the rock. That castle was used for crowning ceremonies, most important meetings and events. In the beginning of the 17th century the castle was destroyed by a fire and now only ruins remind of the beautiful building. The Ring of Kerry is a widely known natural landmark of Ireland. There is a beautiful coast on one side of the ring and spectacular mountains and crystal clean lakes on the other side. As there are several hotels on the coast, travellers are able to stay in this magnificent place a bit longer and enjoy the splendour of local nature. If you need a rare type of vehicle in Ireland (a roadster or a limousine), we advise to look for it at airports and railway office locations, as they offer wider choice of vehicles.